Walking to work in London, it amazes me how little people care about what they look like as they turn up to the office each day. I want to talk ties with you… I’m of the opinion that if you’ve decided to wear one, then wear it! Don’t just let it hang like a dead fish, and DON’T travel to work with it undone, all because you’re ‘flat out and didn’t have the time’. Make time and leave home dressed. Anything less looks awful, and quite frankly you’re better off without one. The necktie traces back to the time of Thirty Years’ War (1618–1648) when Croatian mercenaries from the Military Frontier in French service, wearing their traditional small, knotted neckerchiefs, awakened the interest of the Parisians. The new article of clothing started a fashion craze in Europe where both men and women wore pieces of fabric around their necks. The tie was born. In the last decade or so, business casual became a voice in our daily lives because this gave the impression of being more approachable. The first thing to go was the tie. “Yeah you look great, but lose the tie”, came the calls. But with a recession, and people wanting to give off a sense of ‘Let’s get down to business’, the tie has seen a comeback. After a quick glance at someone’s face, the tie is the next thing you’ll look at. Try it. I bet you do. It will then draw your focus up to the face again. From the point where your jacket does up, the “V” shape made with a closed jacket and all within that space is drawing the attention up towards your face. In many ways it’s the prologue to the main show! There are 3 main aspects to think about when wearing a tie. Think “opposites” in terms of design, and think “complementry” in terms of colour. 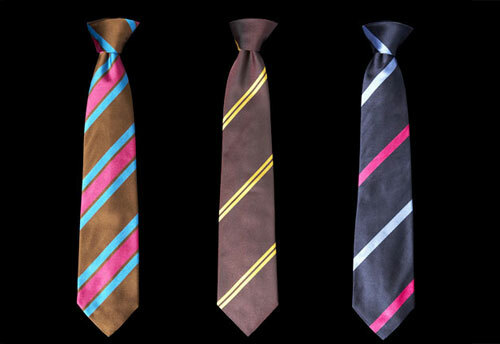 What I mean by that is you need to choose a tie that is opposed to the design of the shirt. So here’s a safe word of advice: If you have a striped shirt then choose either a solid colour or a tie with a spot or other such design. If you are a little more confident in throwing the right things together, then you can try a stripe on stripe, as long as the stripes are of different sizes. So, for example, a thinly striped shirt can be combined with a wide striped tie. If you’re not sure, then leave alone and play safe. The last thing you want to look like is a Zebra gone wrong. And as we all know Zebras don’t belong in the boardroom! Choosing colour is a little easier. As a rule of thumb, all you need to do is draw out a colour from the shirt. So for example, take a light blue shirt with a pink stripe. I would find a blue tie with a dash of pink in it. Remember this: Combine by complementing the colours. Tie width has seen great change over the years. The big kipper ties thankfully were left in the 70’s and ever since ties have become thinner and thinner. Even in the last couple of years the standard width tie has seen a slight tweak by retailers. The skinny tie has made a big impression and a lot of people choose to wear it in the professional environment over the standard width. To get the look right, the tie should compliment the size of your jacket lapels and in turn should be complimenting the width of your shoulders. So the skinny looks top notch if the wearer is less broad across the shoulders, and combines this attribute with thin jacket lapels. This is the perfect permission to adopt the skinny. If you are broader in shoulder and lapel I’d stick to standard tie widths. Leave the skinny to the narrower people of this world! There are a number of ways of tying a tie, perhaps more than you might be aware of, but there are only a few that we commonly use. The Four-in-Hand (School boy knot), Half Windsor and Full Windsor. This knot you probably learnt for your first day at school. Hence why it is referred to as the School Boy. The term “four-in-hand” originally described a carriage with four horses and a driver. The reins for the horses were knotted with a four-in-hand knot. There was also a London gentlman’s club so named where members would wear their neckties with the knot. To this day it is the knot that the majority of us choose to wear. The Windsor knots are the thickest knots amongst the choices as they envolve the greastest number of steps. They were named after the Duke of Windsor, however it is wrong to say that he used them. The Duke did require a thick knot but this was achieved by having ties specially made thicker. In the late 1990s, two researchers (Thomas Fink and Yong Mao) of Cambridge University’s Cavendish Laboratory used mathematical modelling to discover that it is possible to tie 85 different knots with a conventional tie… Now, before you say anything, I think there must be a better way to spend one’s time too! Learn the basic knots and you’ll do just fine. If you’re stuck as to how to tie knots, there are so many online video guides that will take you through the steps. Admittedly some are better than others. Just brief note on bow ties… I often get asked about these and whether its ok to wear them. Like anything and everything in fashion, these things come and go. In the last year or so they’ve popped up in an attempt to be “cool”. One of the ambassadors of the look being TV presenter George Lamb. But if you want my advice… just stay clear. To my mind they are to be reserved for black tie events and the circus! !